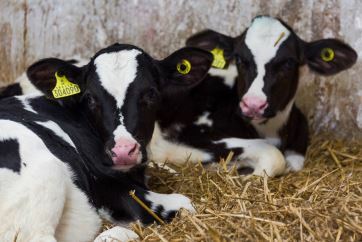 "The first 50 days of a calf's life are crucial to its organ and tissue development, health and growth rates, plus subsequent long-term performance," said Peter van t'Veld, International Technical Manager for Denkavit. "And colostrum is the motor that drives it." He explained that Dutch figures show that nearly 10% of calves born alive are lost within the first year of life and 7.7% of those are between three days and three months old. Over 70% of that mortality is due to digestive disorders. "It is all too easy for our time to be taken by the milking cows and in many ways we are guilty of not paying the calf enough attention," Peter stated. "High quality colostrum, in the right amounts and at the right time, is crucial to giving the calf the start it needs and building immunity. This is a race against time. Antibody levels in colostrum start decreasing from the onset of calving, not from when the calf is born, so a long calving can have a huge effect on the quality of the colostrum produced. Add to this the calf's gut, which also loses the capacity to absorb colosturm (by six hours after birth it has lost nearly half that capacity), and timing is everything." "The first colosturm needs to go into that calf as early as possible, ideally four litres within the first two hours. Research has shown that calves that receive this four litres of high quality colosturm have lower vet costs, culling rates and better weight gain, than those that receive only two litres," he said. "Make sure the calf receives colostrum in quantities adapted to the volume of its abomasum, so no more than 5% of the calf's body weight per serving. Ideally, colostrum should be delivered over three servings so the calf receives 15% of its body weight in the first 24 hours. Preferably this should be administrated by teat but weak/dull calves can be tubed. Colostrum also needs to be of sufficient density, more than 50g/l IgG (but preferably closer to 70 g/l IgG) in order to get a blood serum level of 10 g/l IgG. "Make sure the colostrum is clean. The higher the germ count in the colostrum, the lower its quality. Collect it in the right way; from a clean udder, using clean hands, milking equipment and bucket. Heat treatments to 60°C will help to significantly reduce the germ count, but make sure you check the temperature - while 60°C is good, temperatures above 62°C or 63°C will significantly decrease the quality of that colosturm. Check your pasteuriser! "Use a refractometer, Colostro Balls or densimeter to measure colostrum quality and keep records of what you collect and calf performance. This will give you the information to help build a picture of your colostrum management system," he concluded. For more information contact your calf specialist here. Heifers are the best genetics in your herd, said Steven Morrison, from the Agri-Food and Bioscience Institute (AFBI) in Northern Ireland. Recent figures from AHDB Dairy show that the average PLI of heifers in the British herd stands at 176 whilst the average PLI of cows in their second lactation is 72. "Don't tiptoe around hygiene when it comes to calf health and performance", said jamie Robertson from Aberdeen University. He explained that work done by Owen Atkinson as part of the Dairy Youngstock Project in 2015 showed that 25% of heifer calves were treated for scours and 78% of farms had majoy scour pathogens diagnosed.